Pour the light rum, dark rum and triple sec into a glass with ice. Fill it with orange juice and sweet and sour. 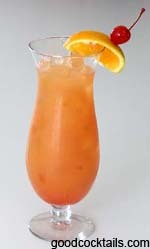 Add the grenadine and top it off with 151-proof rum.